This year, I think the words I used the most in my job as a fashion editor were "sold out," "waiting list" and "back in stock," as "It" is no longer just used to preface handbags. 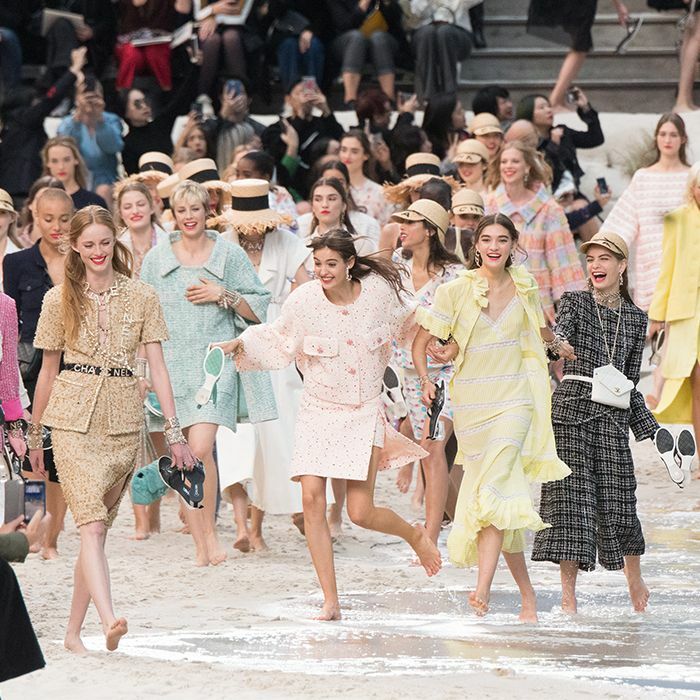 A number of dresses, shoes, slip skirts and even hair clips were awarded cult status this year, and thanks to the hype became almost impossible to get a hold of. Global fashion search engine Lyst tracked over 100 million searches this year to rank the most in-demand pieces. Sustainable trainers by Veja were the most searched-for Instagram brand of the year (thanks to Meghan Markle), followed by the likes of Ganni, Staud and Stine Goya. Other standout pieces mentioned by Lyst are Loewe's raffia tote, the Shrimps Antonia beaded bag and Fila disruptors. Compiling a list of the cult items of 2018 seemed, at first, like a never-ending task, so we've strictly included the items that Who What Wear UK editors really cared about and believed in this year. 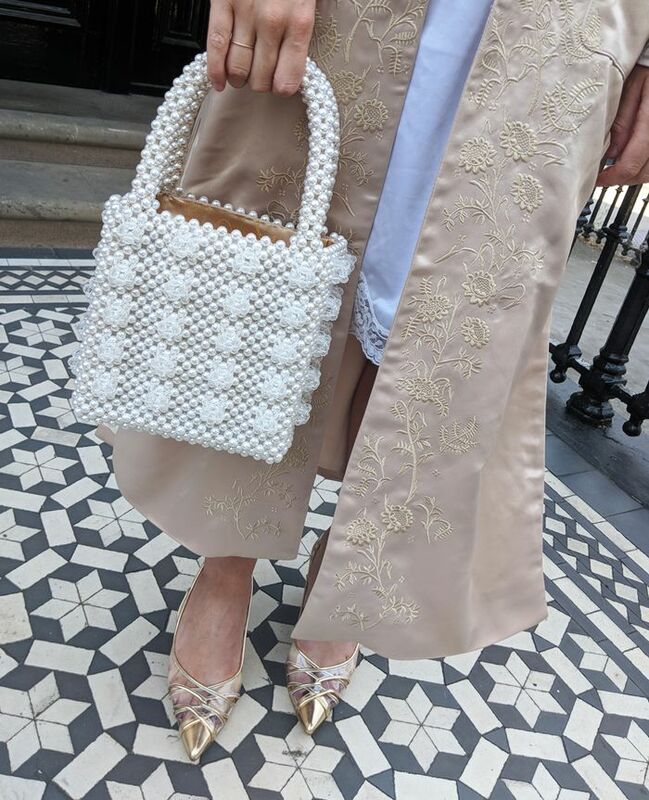 Shrimps Antonia Faux-Pearl Embellished Bag (£450). Shrimps' pearl Antonia bag has been popular every month this year and has more longevity than we initially thought. The pearl-coloured bag is perhaps the most classic; however, it is now available in gold, powder blue, red, black, navy and more variations. Saks Potts Yvonne Single-Breasted Polka-Dot Wool Coat (£1108). Copenhagen-based brand Saks Potts creates the coolest coats that have become a regular feature on our Instagram feeds. Jacquemus Le Chapeau Souk Straw Hat (£267). This £332 Jacquemus hat might be totally impractical, but as Hannah Almassi wrote in June, trying to get your hands on one was all a bit Raiders of the Lost Ark (they are rare, and you’ll struggle). Ghost was seen as a destination for pastel bridesmaid frocks and occasion-wear only—until 2019. This blue printed dress was arguably the most Instagrammed of all and is now available in many more colours. Topshop Satin Slip Skirts (£29). We have chronicled every single turn in the Topshop satin slip skirt story (they go, they come back, they go, they come back…). At last count, the employees in our office owned 12 versions of this skirt. Shell jewellery was one of the key trends of the summer, and the brand Tohum almost instantly catapulted to become a cult brand. If we had to crown one item the most Instagrammed fashion buy of 2018, it would have to be this leopard-print slip skirt from Réalisation. Loewe Small Raffia Basket Bag (£250). Almost every fashion buyer and influencer took the Loewe raffia basket bag on their travels this summer. When it comes to dresses, Copenhagen-based brand Stine Goya created the most noise with joyful, printed midis. Ganni Leather Cowboy Boots (£460). Every street style gallery in September featured at least one pair of Ganni's cartoonish cowboy boots. Ganni Denim Boiler Suit (£259). According to Lyst, Ganni's pink jumpsuit is the fourth most-searched-for cult product of the year. Alighieri's gold pendant necklaces are loved by many of our favourite influencers, such as Monikh. They're also perfect for stacking (in case you want to build a collection). Rixo Jade Printed Crepe de Chine Midi Dress (£186). Rixo has dressed all of our editors in 2018, but if we had to pick just one standout dress, it would be this starfish print. Designer Susan Alexandra creates handmade beaded bags in the happiest colours she can find, and sometimes even adds mini strawberries and clementines on top to make them even more fun. Jacquemus has a habit of creating sellout items, and the Baya dress was one of the most popular items by the brand this year. Emma Watson first wore Veja trainers in 2016, but it was this year that they really took off and became the number one shoe for London girls. Meghan Markle even wore a pair on her royal tour of Austalia. This year, many people have been investing in a piece of "old" Celine, however, the alphabet charm necklaces have been the most popular Phoebe Philo momento. This season, Joseph managed to make a jumper the subject of street style hype thanks to its orange scarf and jumper hybrid. The Topshop pinafore dress has been restocked countless times now in different colours and prints, and each time, it sold out as soon as it went online. This year, Dior relaunched its iconic saddle bag, and Lyst crowned it the second most popular It bag of the year behind the Gucci belt bag. This was the year of the dress on the high street, and this green ASOS tea dress was one of the first It midis of the year. New handbag label Wandler only launched in November 2017, and its signature bag the Hortensia has one of the most unique silhouettes we've seen in some time. This is an It bag that will last long beyond 2018. It's hard to pick just one Mango item for this list, as so many pieces take off on Instagram thanks to the #MangoGirls. However, this oversized brown coat was the standout piece for us. At London Fashion Week in September, I saw a pair of these £650 strappy slingbacks with small heels by The Row every 10 minutes. This was the year of the hair clip, and this Gucci logo crystal-encrusted slide had a real moment during fashion week. Square-toed sandals were a big trend this summer, and this was all started by Instagram-famous brand By Far. Saks Potts Logo Tights (£60). Saks Potts's £60 monochromatic logo-printed tights have been worn by a host of influencers and became a surprising cult buy of the year. Leopard print invaded our wardrobes this year, and there were a number of dresses we could have added to this list; however, this £38 leopard-print maxi was arguably the hardest to track down. In August, these £50 Carrie Bradshaw–looking strappy style shoes from Zara were a hit with the fashion crowd. At fashion week in February, many editors and street style stars wore this brown horse-embellished trouser suit from Chloé. It is perhaps the strongest piece creative director Natacha Ramsay-Levi has designed for the house. These Chanel quilted "dad" trainers are so hard to track down that even influencer Monikh had to entrust the help of a personal shopper to find them for her. Following on from the success of the Bissett and the Moreau, Staud launched a new It bag this year (which was arguably even more popular): the Shirley. Fila Disruptors were listed as the second most searched-for item on Lyst's Index for the second quarter of 2018, only falling behind the Gucci logo belt. The global fashion search engine told us these chunky, purposefully "ugly" shoes are the most searched-for trainers in London right now. See our guide to the key trends for spring/summer 2019.